“It's done! For four months,” one of the officials told AFP right after the meeting in Brussels came to an end. An hour later, the Eurogroup issued a statement confirming the deal. "The Greek authorities will present a first list of reform measures, based on the current arrangement, by the end of Monday February 23," the statement said. "The institutions will provide a first view whether this is sufficiently comprehensive to be a valid starting point for a successful conclusion of the review. This list will be further specified and then agreed with the institutions by the end of April." Athens has confirmed the implementation of structural reforms and its obligations to repay the existing debt, Europgroup representative Jeroen Dijsselbloem. A deal has also been reached to provide financial assistance to Greece, which will have access to the EU financial stability mechanisms during the program to recapitalize banks. “The four-month period will be a time to rebuild new relations with Europe and the IMF," Greek Finance Minister Yanis Varoufakis told reporters. "Greece has turned the page" and won some time to negotiate a better bailout deal, the official said, emphasizing that Greece had not used any threats or bluffs to reach an interim agreement with the Eurogroup. European officials told Reuters than the deal was reached during preparatory talks involving the Greek and German finance ministers, as well as the managing director of the IMF. After that, it was agreed on by all 19 members of the Eurogroup. The EU creditors have insisted that any extension of loans should be accompanied by Greece’s commitment to a certain set of budget measures and reforms. The newly-elected leftist government in Athens initially asked for a six-month loan extension to get more time to renegotiate its €316 billion debt. The Friday’s agreement removes the immediate risk of Greece running out of money as early as March, which could’ve possibly resulted in the country’s exit from the eurozone. 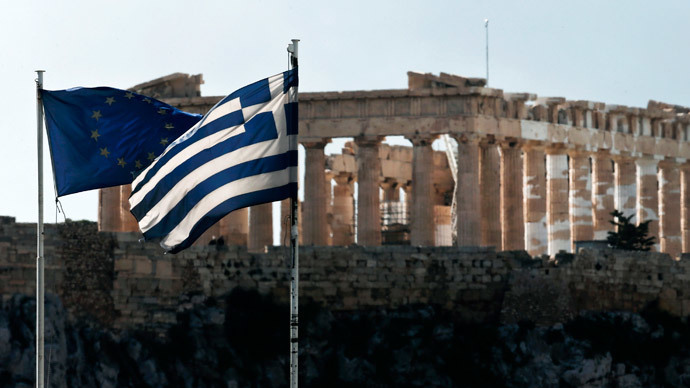 As part of the deal, Greece agreed to submit a list of economic reforms by Monday for the EU's approval. Athens is expecting an answer by Tuesday. Greece’s current bailout loan of €240 billion was agreed by the country’s previous government in back 2012. The harsh conditions of the bailout program, which include cuts in government spending, higher taxes are extremely unpopular in Greece.